First off -- Roswell's still kicking. She seems to have no idea that she has cancer. So that's good. Lots of people have been coming to visit her. Top Sekrit No Longer! 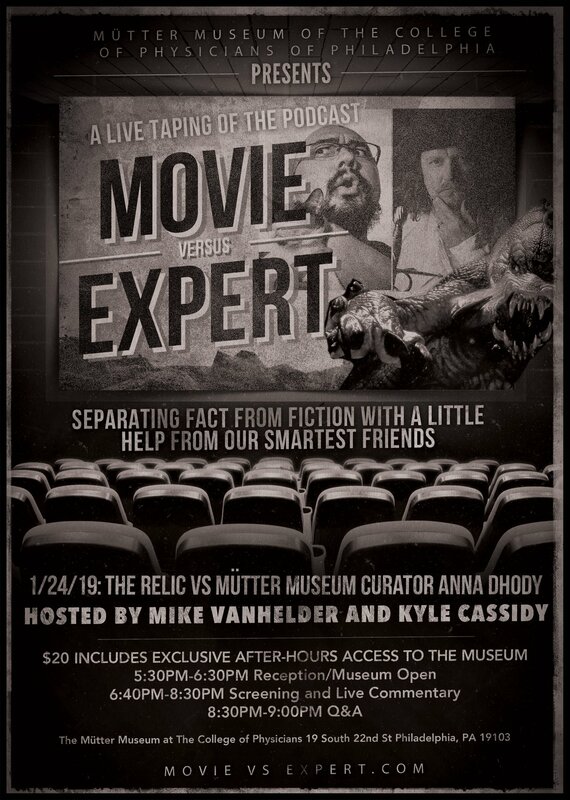 Tomorrow, Mütter Museum, be part of the studio audience for the live taping of our podcast MOVIE vs EXPERT, a podcast where we watch movies with experts and separate fact from fiction. Tomorrow co-host Mikey Mongol & I are subjecting Mütter Museum curator Anna Dhody to the 1997 museum monster film THE RELIC. $20 includes AFTER HOURS ADMISSION TO THE MUSEUM. See the soap lady without all the crowd. Light snacks / cash bar! Oh, that sounds like SOOO much fun! Wish I lived closer, I'd come. Forget that fact that I have to work tonight. I remember when the book The Relic came out. We chatted about it a lot in an AOL chat room called Bookaccino. And then we chatted about it some more when the movie came out. Have fun!! and many scritches to Roswell from the crew here. it is super fun. i know the stuff that i know a lot about and how it changes the way i appreciate movies or get annoyed with them. it's great to watch movies with experts in fields i know little about and see how things outrage or endear them.